It could be the theme from one of those “feel good” movies. A tiny mountain community is threatened with economic disaster unless they can raise three million euros in one month to replace a faithful but aging ski lift. However this is no film script but the real life drama being played out in the Chartreuse Mountains 30 kilometres north of Grenoble and it could cost 125 jobs and affect one family in two in the area. It may also be the shape of things to come for the region’s mid-mountain ski resorts. The ski lift in question is the Battour two man chair, a backbone linking the ski resorts of Saint-Pierre de Chartreuse with le Planolet. The lift covers 500 vertical meters and dates from 1974. 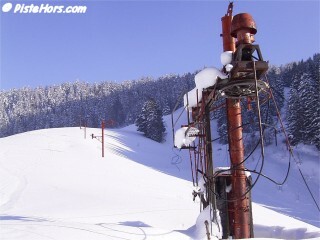 A time of abundant snowfall and winters that lasted from December to April. This year the pylons showed signs of metal fatigue. To comply with stringent safety requirements the lift needs a major work costing around 800K€. This not considered viable for an old and slow chair. In 2001, the Isère department appeared to have grasped the nettle of climate change when it asked the consultancy Dianeige to study the future of the department’s ski resorts. The report suggested focusing aid on a number of key ski areas that had a future and help other communities convert to different tourist activities. Saint-Pierre, a village of 780 residents and situated at 900 meters altitude, was highlighted as one of the resorts where downhill skiing has a future. The plan is for a replacement chair lift, on a slightly different line, to take into account climatic conditions in the early 21st century. The cost is put at 4.5M€ for a high speed four seater chair or 3.9M€ for a four seater chair with a moving carpet to speed up loading. Saint-Pierre runs the lift system in partnership with neighbouring village Saint-Pierre d’Entremont through the structure of a SIVU (syndicat intercommunal à vocation unique). They say that since the Dianeige report they have had four years of fruitless negotiations with the department, the Rhône-Alpes regional council, the Chartreuse natural park and the surrounding communities and that things have now come to a head. If a replacement is not ordered within a month it won’t be ready for the 2006/7 season. The result will be an estimated loss of 40% of turnover and the effective bankruptcy of the SIVU that will not be able to cover operating costs. The Rhône-Alpes has an annual budget of over 1 billion euros nearly a quarter of which is scheduled for infrastructure and economic aid. The community has 1.2M€ available that was initially allocated for developing activates outside of downhill skiing and the SIVU has a cash reserve of 300K€. On Friday the Isère department agreed an additional 1.23 M€ of aid (although it is not clear if this is new money or part of the previously agreed aid). Even with the new lift the future for Saint-Pierre remains uncertain. The gondola lift that links the 900 meter resort with the ski area needs a major revision in 2009 which could cost as much as 700K€. Michel Becle-Berland the mayor of Saint Pierre is angry. He says the village has played the game with the department and has done everything asked. He thinks that other communities in the area should contribute to the costs as it is effectively their playground. The lifts offer both winter skiing and access to summer walking, mountain bike trails and hang gliding. Bernard Barbey of the action committee says that the resort is vital for the economic activity of the region and that there is lots of money infrastructure for towns (for example the third line of the Grenoble tramway which opened on Friday at a cost of 250 M€). Defying predictions snow conditions for the last two winters have been excellent and the turnover of the SIVU has climbed 30% to 1.6 M€. After an early start the area closed in the third week of March in 2006. Something the resort blames on the lack of snow canons on the lower slopes. 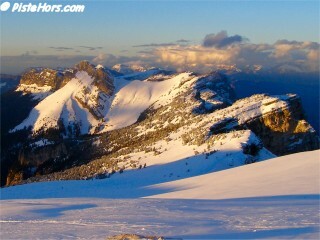 With 35km of runs including 4 black pistes the area is the jewel in the crown of Chartreuse skiing. A lift pass costs just 15€ a day in high-season. Less than half that of the big Savoie resorts. Extreme skier Patrick Vallençant learned off-piste on the slopes of the Terres Brûlées in the 1960s. Anyone who has traveled in the Chartreuse mountains cannot fail to have been enchanted by their beauty. The summits are not high, around 2000 meters but it is a green and pleasant land, full of babbling brooks, sheer yellow tinged cliff walls and forests. Even wolves have returned to the area although there are no signs of the brown bears that once roamed the valleys catching salmon in the streams. The resort has vowed not to go quietly. 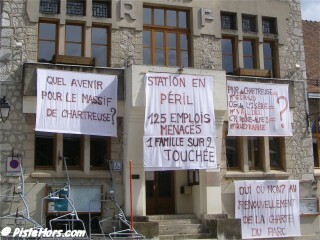 In a typical French fashion local businesses staged a strike last Thursday to draw attention to their plight and an action committee has been formed. Will a solution be found at the 11th hour? It is not certain. In 2004 Artouste in the French Pyrenees closed but was rescued by a white knight in the form of Altiservice a year later. In 1995 the Col du Coq, just 10 km to the east of Saint-Pierre de Chartreuse and in an excellent location for snow, closed. Today the lifts lie rusting, a sad reminder of better times. The deal is almost done. St Pierre and its partners have managed to raise the necessary funds and a six seater high speed chair should be ready for the start of next ski season. The chair will be on a shorter line to take into account the higher snowline of the 21st century and will enable the resort to operate after the village gondola lift goes into retirement in 2009.